Extraordinary road which Italian engineers constructed across previously untouched mountains in southern Albania which led until Salonika; and it is still in use today. The supplies to the Allied forces on the Macedonian front had no longer to risk the threat of enemy submarines around the Greek coast. 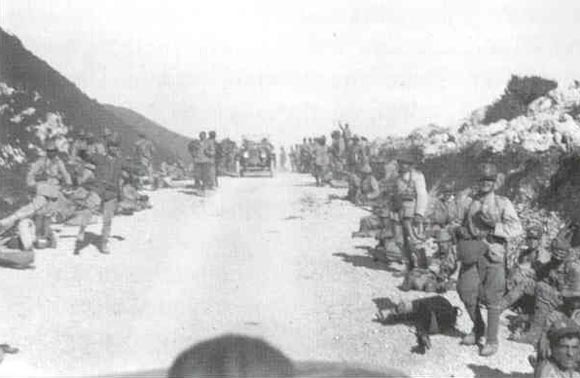 Salonika: Italian 35th Division (11,000 men) and 32 guns lands (until August 25), relieves French 57th Division by August 27. General Cordonnier now in command of French Army of the Orient. Battle of the Somme: Joffre dissatisfied with offensive developing into innumerable minor actions, demands return to Allied attacks on broad front and writes to Haig proposing capture of line Thiepvall – High Wood – Ginchy – Combles – river Somme by 3 operations beginning on August 22. Then (c. September 1 ) attack to be against Grandcourt – Courcel­ette – Martinpuich – Flers – Morval – Rancourt – Bouchavesnes.